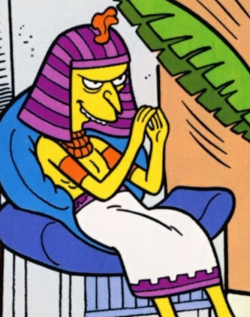 Rumses IV is a pharaoh of the Ancient Egypt. When Homer dreamed there was no beer in the world anymore, Lisa helped him find out, by using the Internet, Rumses IV called it beer, but he banned it after a pyramid of him was destroyed by a drunk person. Modified on July 3, 2017, at 04:10.